UW-Eau Claire football coach Wesley Beschorner runs alongside Braden O’Laughlin during the Blugolds’ spring practice on Monday. UW-Eau Claire’s Sam Newell ties his shoes prior to the Blugolds’ first practice of the spring on Monday. 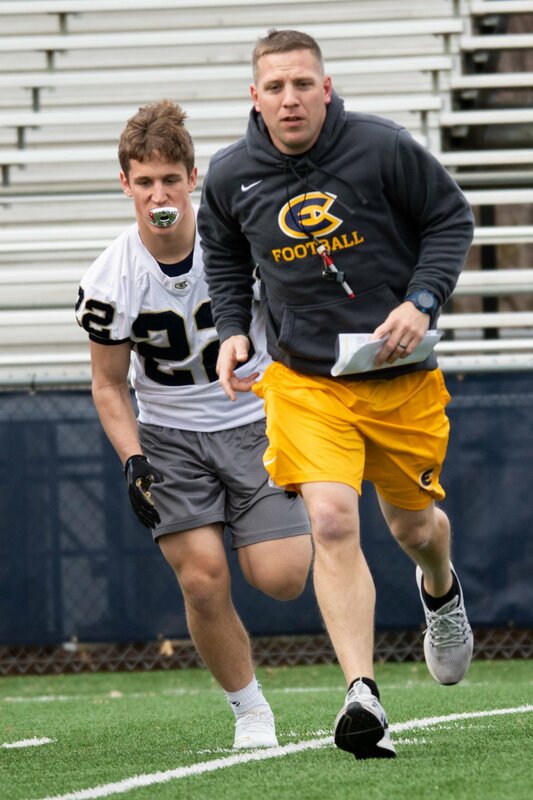 Speed was the focus from the start for Wesley Beschorner in his first spring practice as the head coach of UW-Eau Claire football. As soon as the team finished warm-ups, Beschorner took the offensive unit to one side of the Carson Park field and began running through plays, spurring them on all the while. “We’re not walking,” the new Blugold coach exclaimed as he paced behind the line of scrimmage. The following 30 minutes, the chunk of practice open to the media, were filled with plenty of variations of “you’ve got to get there faster.” The intensity matched what Beschorner laid out in his media availability earlier Monday afternoon. But of course, there is a limit to how high the team can turn up the juice. “Too bad we can’t tackle,” Beschorner said with a laugh. Beschorner, a head man for the first time in his career, is now over a month out from his introduction. He’s moved into his new home and gotten comfortable in his office in the McPhee Center. But until Monday, his time working with players had been limited to meetings. There’s only so far you can progress without getting on the field and building muscle memory. While Beschorner learns his players’ tendencies, they’re learning his too. Outside senior linebacker Sam Romanski said the team has already gotten to know Beschorner well, and the positive vibe is noticeable. Sophomore offensive lineman Drew Schrader echoed his sentiment, noticing what Beschorner brings from his time with Rice, Pittsburgh and Maryland. Beschorner said the plan is to run practice three days per week, maybe four depending on the weather. While it was a beautiful 70 degrees on Monday, a midweek snow storm will create a bit different environment starting on Wednesday. He wasn’t ready to call off practice yet, though. “It’ll snow in the playoffs, so let’s go,” Beschorner said. The quarterback position is the biggest question mark Beschorner and crew face entering spring ball. The Blugolds are looking for a replacement for Scott Procter, who threw for 1,412 yards and six touchdowns as a senior in the fall. Jonathan Malueg played minimally as a freshman, completing two of his nine attempts for 44 yards. He took the first snap as quarterbacks were cycled through in drills, but Beschorner said the competition is completely open. Time on the field over the next few months should be enlightening. Eau Claire athletic director Dan Schumacher stressed the importance of keeping a majority of Dan Larson’s staff both at Larson’s departure press conference and during Beschorner’s introduction. So far, Matt Tomsho is the only new face Beschorner has brought in, but he said others are coming. Beschorner, Schrader and Romanski all said that’s helped with the transition. One of the returning figures is defensive coordinator Matt Ebner, who was running the defensive plays while Beschorner focused on offense. Ebner commanded a defense that led the WIAC in sacks and finished third in passing and total defense last year. Romanski, an All-American last season, said he was excited Ebner remained on the Blugolds staff. So far he’s seen some minor tweaks, but expects the unit to mostly stay the course after the positive signs in 2018.